2:27 PMOAKLAND, California — Remember when LeBron James broke out a short suit outfit, valued $46,964.95, for Game 1 of the 2018 NBA Finals? Well, the ensemble is actually worth much more. Just take a look at the Cleveland Cavaliers star’s wrist. Ceramic case, bezel and crown. Black ceramic case, black dial, anthracite strap. “It retailed in shops for right over $40,000,” FakeWatchBusta told The Undefeated via email. The watch can be found on websites, such as swissluxury.com, for a resale value of as much as $46,495. 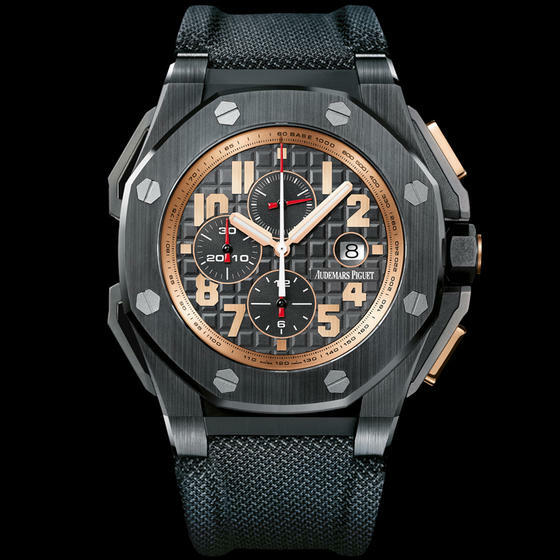 But there’s certainly a chance James’ version of the Royal Oak Offshore Schwarzenegger could be worth more. The Audemars Piguet Royal Oak Offshore Arnold Schwarzenegger The Legacy Chronograph, worn by LeBron James pregame and postgame of Game 1 of the 2018 NBA Finals. James has a longstanding partnership with Audemars Piguet that led to the limited release of his own signature watch, the Audemars Piguet Royal Oak Offshore LeBron James, in 2013. At a retail price of $51,500, only 600 pieces dropped worldwide. And in early 2018, the watchmaker tapped James for an ad campaign directed by fashion photographer Rankin in celebration of the 25th anniversary of the iconic Royal Oak Offshore. Come Game 1 of his eighth-straight Finals appearance, James’ choice of watch was surely a no-brainer. The Royal Oak is fit for a king and apparently worth every penny. The accessory brings the minimum total of this Game 1 outfit to nearly $87,000 — not even including his custom jewelry. Guess that’s just the luxury of getting paid more than $33 million a year to play in the NBA. 12:59 PMOnly the NBA — and one of the weirdest, most controversial and high blood pressure-inducing regulation endings ever — could make a Kanye West album listening session a secondary story. 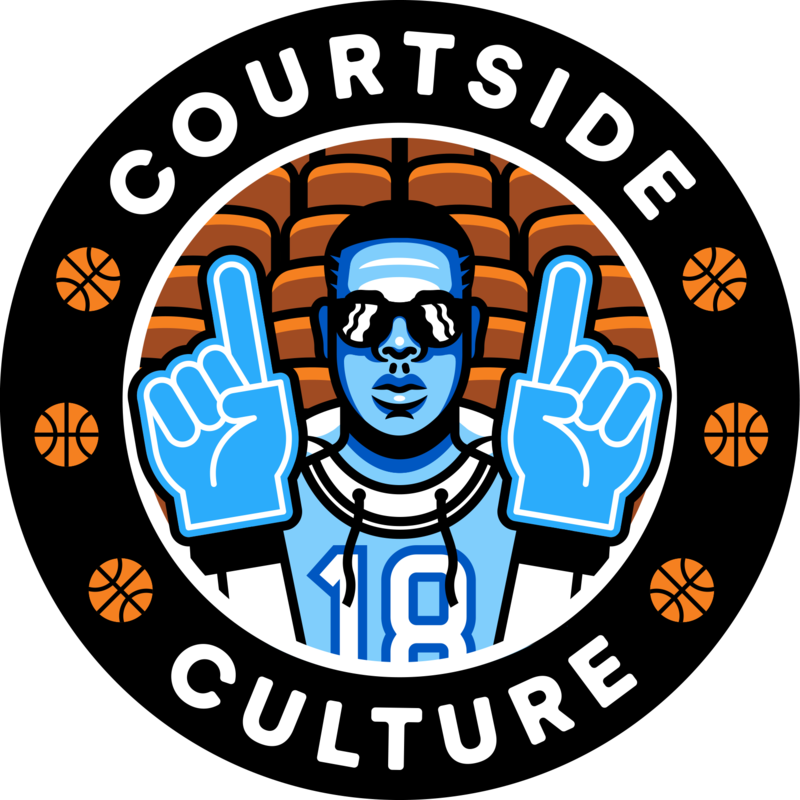 Thanks to the Golden State Warriors and Cleveland Cavaliers, particularly J.R. Smith, such was the case Thursday night. West, who has been in the news for all the wrong reasons since he returned to social media and the public spotlight, played his new album ye in Jackson Hole, Wyoming, for invited media members, a host of collaborators and close friends who included his wife, Kim Kardashian (who just returned from a White House visit with President Donald Trump regarding prison reform). Lyrically, the album is standard Kanye. A witty punchline here, a cringeworthy run there (i.e., his Russell Simmons/#MeToo line on “Yikes”) and a splash of introspection. Those looking for lyrical precision are better off taking in Black Thought’s Streams of Thought, Vol. 1 EP that was also released Thursday night. Or a more cohesive listen in A$AP Rocky’s TESTING. If nothing else, West is a producer capable of stringing together glowing moments with soul samples, well-placed singing features (Jeremih, Charlie Wilson, Ty Dolla $ign and more) and harmonies. Last month, West told The Breakfast Club‘s Charlamagne Tha God that while he was on medication he didn’t go to therapy because the world was his therapist. The music, in both positive and negative ways, reflects this. Look no further than ye‘s most honest moment in “Wouldn’t Leave,” featuring PARTYNEXTDOOR and the aforementioned Jeremih and Ty Dolla $ign. West weighs the consequences of his actions and offers unique perspective into how his recent controversial comments affected his marriage. When West infamously proclaimed on TMZ that “slavery was a choice,” the world erupted. Unfortunately for West — as a considerable amount of his fan base, many who have been searching their souls for weeks now, came to this conclusion — the music doesn’t matter more than the man and the actions he takes. Just ask Rhymefest. 12:50 PMIn April, Starbucks was in the news because a Philadelphia store manager called the police on two black men who were waiting for a friend. To address the bias that could lead to such an unfair response, Starbucks closed its doors early on Tuesday to send its employees through an anti-bias training session. I talked to two employees from different stores who participated in different sessions. After the conversations I was shocked, confused, and slightly encouraged. Here are excerpts from our conversations. Frank is a white male in his late 30s. Mark is a person of color in his mid-20s. Do you think the session was needed? Mark: Truthfully, as a person of color, I feel as though these are things I intrinsically already understand. But I believe it was necessary for my store specifically. Mark: On a different occasion a co-worker said to me, ‘I’m brown just like you, just on the inside’ while I was washing dishes one day. And another time, a friend told me that she heard transphobic comments as we just hired an individual who is transitioning. I didn’t report any of this, because it will just make a hostile work environment. I am trying to transfer. What was the goal of the session? Mark: Being Color Brave was one of the main themes. The term colorblind was referenced as a platform long ago used to describe people who don’t see color, which is now known to be just as bad. Color Brave is being brave to be who you are and embracing your racial and ethnic backgrounds. What happened in the sessions? Mark: One of the first activities we did was introduce ourselves in small three- to six-person groups. We then were told to break off into pairs within those groups and make a list of eight reasons why we are different. Frank: For me the most effective exercises were watching videos of people of color still telling stories about how they get followed in stores to ‘prevent theft’ and then hearing one woman say that she wishes she could walk out her door and feel carefree like the white guy she sees on the street. That last part is a direct quote and it bothered me to my core that still this bulls— continues. Frank: They gave us 39-page workbooks. We were supposed to write our thoughts in them and take them with us. 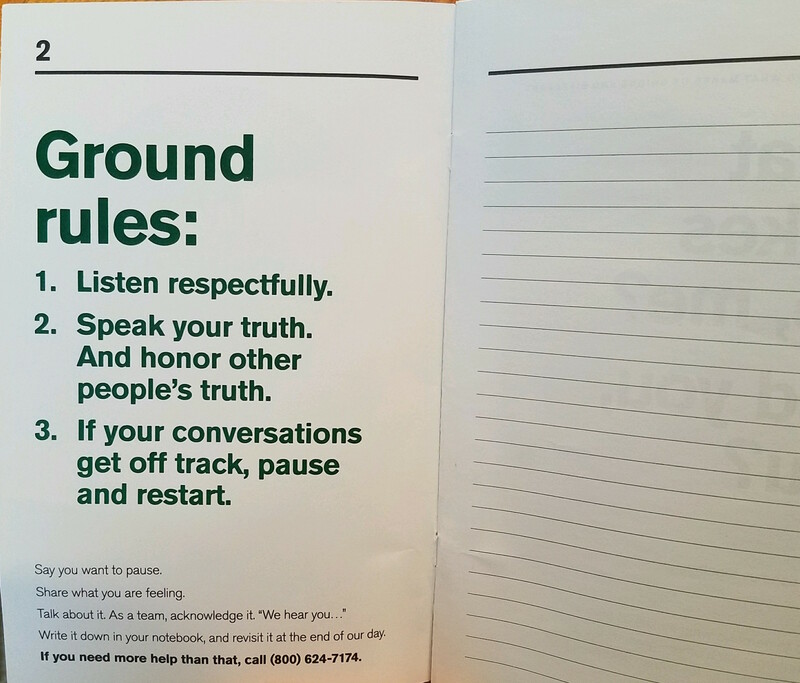 This shows two pages from the diversity training workbook used in May 29, 2018 training of Starbucks employees. Mark: They explained the difference between explicit and implicit bias. Then they ran us through the Stroop Color [and] Word test so we would understand that stereotypes are cognitive shortcuts we form. Mark: For the company, perhaps. Maybe it can stand as a pillar of equality, great. Frank: Yes. I think more companies need to do this, but the real change that needs to happen are everyday people coming to the same realization that racial bias needs to stop. That’s when true change will happen. I just wish it was easier. People give up because learning anything new is tough and Americans are lazy. How would you describe the training with one word? Closing 8,000 stores for a half-day most certainly cost Starbucks some profits. But the costs of biases are ordinarily paid by the same segment of our society. And they don’t get to pick the day or the price. On April 12, when Rashon Nelson and Donte Robinson were cuffed and arrested, they were forced to pay with a bit of their dignity. Though everyone knows one session won’t eradicate biases held by Starbucks employees, if the result of the session is a lower likelihood of an incident like that recurring, then Tuesday’s cost is a worthwhile investment. The moment occurred during the Western Conference finals against the Houston Rockets. Before Game 6, Young showed up to Oracle Arena holding a fresh new pair of Adidas’ “Gratitude/Empathy” Crazy BYW Xs — a collaboration with superproducer Pharrell Williams. In late April, Pharrell — who signed with Adidas in 2014, and has since inspired some of the brand’s most coveted lifestyle shoes — wore the BYWs for the first time during a press tour in China for another one of his signature collections. But the sneakers hadn’t made their debut on 94 feet of hardwood until Young began warming up in them before the Warriors’ 115-86 blowout win over the Rockets on May 26. Unbeknownst to Young, the player commonly referred to in both basketball and fashion circles as “Swaggy P” — Pharrell would be sitting courtside for Game 6 with the shoes on his feet. “When they told me he was showing up,” Young said, “I was like, ‘Man … please, coach, lemme play a little bit!’ That’s Pharrell — somebody I look up to, fashionwise, and how cool he is.” Warriors head coach Steve Kerr obliged, throwing his backup sharpshooter into the win-or-go-home matchup for 16 minutes, during which Young dropped five points while rocking the kicks. Swift action was needed, but should it ever have come to this in the first place? 4:08 PMShould it ever have gotten this far in the first place? ABC canceled the second season of its Roseanne reboot Monday after its star, Roseanne Barr, tweeted a racist insult about former Obama White House adviser Valerie Jarrett. Within hours, Wanda Sykes, who had been a consulting producer on the show and was reportedly slated to take over the writing room in the show’s second season, tweeted that she would not be returning, essentially announcing that she had quit. “Roseanne’s Twitter statement is abhorrent, repugnant and inconsistent with our values, and we have decided to cancel her show,” ABC president Channing Dungey said in a one-sentence statement to the press shortly after Sykes’ tweet. Dungey is the first black woman to preside over a broadcast network. On one hand, it’s easy to say this is exactly what should have happened. But I’m not so sure ABC should be applauded here. Barr made plenty of hateful quips on Twitter before the network hired her for the Roseanne reboot. What did they think was going to happen? ABC has long branded itself as “America’s Network.” The decision to invest in a newly MAGA-fied Roseanne seemed to suggest that the network was accommodating a portion of the populace that has come to be associated with racialized violence, such as in Charlottesville, Virginia. Tuesday morning, in an essay on the third season of Queen Sugar, I took Dungey to task for giving Barr so much leeway while refusing to extend the same freedom to black-ish creator Kenya Barris. After all, it was under Dungey’s leadership that Barr’s show included a joke directed at fellow ABC sitcoms Fresh Off the Boat and black-ish, essentially reducing them to little more than Asian and black versions of “normal” white families. At the Television Critics Association press tour in January, Barr’s pre-reboot tweeting prompted questions. After all, Barr had tweeted a story from conspiracy theorist Alex Jones’ InfoWars site claiming that President Donald Trump would have won the popular vote had “5.7 Million Illegals” not voted in the 2016 presidential election. She called intersectionality a “degenerate pseudo philosophy of fake left” and shared multiple tweets best characterized as transphobic and Islamophobic, calling Muslim immigrants “savages.” She trafficked in the Seth Rich murder conspiracy. When challenged, Barr and the rest of the writers and cast present, including showrunner Whitney Cummings, gamely laughed off her unhinged screeds. The problem wasn’t what Barr was saying, was the implication, but that she was saying it on Twitter. Barr informed the press at TCA that she and her children had found a solution: to take away her phone and change her Twitter password, as if that would somehow prevent Barr’s Islamophobia from seeping into the show. (Spoiler alert: It didn’t.) In January, her bigotry was distasteful but it wasn’t disqualifying. Why not? ABC spent months building anticipation for Roseanne’s return, and it worked. The show’s reboot debuted to an audience of 27.3 million viewers, absolutely gobsmacking numbers in our age of streaming, DVR and video-on-demand. The network quickly greenlit the now-canceled second season. But its all-too-predictable ugly collapse should leave the executives of America’s Network seriously asking themselves: Was it worth it?